Are you wondering which form fields you have access to in WPForms and what each field does? 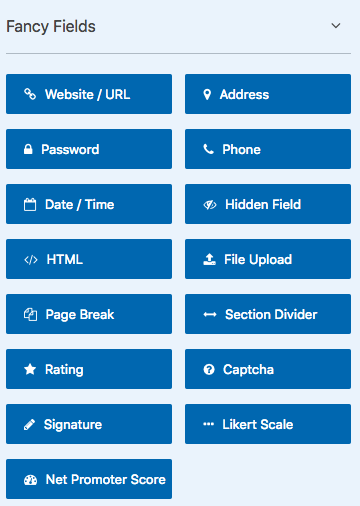 WPForms has lots of field types to make creating and filling out forms easy. 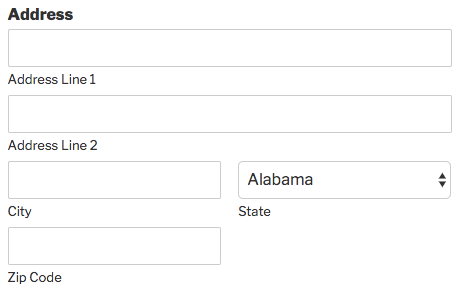 In this tutorial, we’ll cover all of the fields available in WPForms. 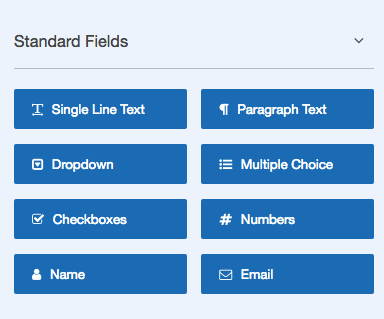 Standard Fields are available to all users in WPForms. The Single Line Text field allows users to enter any characters, with no validation rules. The Paragraph Text field provides a larger box for users to enter text, with no validation rules. The Dropdown field contains a list of items that is displayed when users click on it, and allows users to choose an item from the list. The Multiple Choice field allows users to choose only one item from a list of options. If you’d like, this field also includes options to randomize choices and add images to choices. The Checkboxes field allows users to choose any number of items from a list of options. This field also includes options to randomize choices and add images to choices, if you’d like. The Numbers field allows users to enter numeric values. On hover, arrows within the input field allow users to increase or decrease the number value by 1. The Name field provides several options for name formatting: a single line, subfields for First and Last Name, or subfields for First, Middle, and Last Name. The Email field allows users to enter only a valid email address (for example, someone@email.com). If the user is using a popular email address (Gmail, Yahoo, etc) and includes a typo, the Email field will detect this and suggest a correction. You can also optionally add an additional ‘Confirm Email’ field. The GDPR Agreement field will display a required checkbox asking the user for consent to collect and store their information. For more details, please see our tutorial on GDPR compliance. Fancy Fields are available with all paid licenses for WPForms (unless otherwise noted). Only website URLs can be entered in this field. The form automatically checks if the URL is in a valid format (for example, https://wpforms.com). To help uses avoid formatting confusion, this field will automatically add http:// to the front of a URL written in shorthand. For example, wpforms.com would be automatically converted to http://wpforms.com. The Address field provides a collection of labeled sub-fields in a clearly set out format. The address field offers two formats: US and International. The US format allows users to choose a US State from a pre-loaded dropdown list, while the International format allows users to choose from a dropdown list of countries. The password field is used within a user registration or login form. Each character is obscured as dots for security. 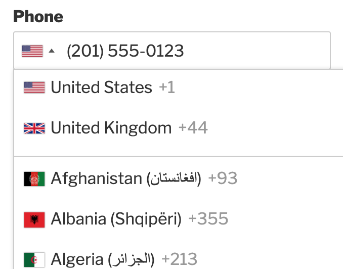 The Phone field accepts phone numbers from users, and allows three formats: Smart, US, or International. The Smart format is the default, and it will use the user’s location (based on IP address) to determine the required phone number format. To help guide the user, the field will display a flag indicating their detected country and placeholder text to demonstrate the format. If the detected location isn’t accurate, or if the user needs to enter a phone number in a different format, they can simply click the flag to choose a different location. You can also choose a specific format for all users, if you’d prefer. The US format will always require a (###) ### – #### format, whereas the International format is more flexible. 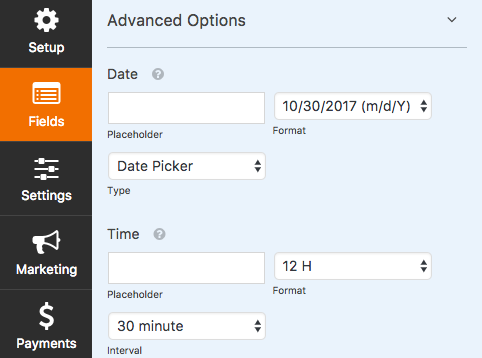 By default, the Date/Time field will display fields for both Date and Time selections. The Hidden Field is not visible to users, and so can be used to capture or display any information you’d prefer to collect without allowing the user to see or change the field value. For example, Smart Tags can be used to collect information like the current page URL, which may be useful for you to see in an entry but would likely be confusing to a visitor if it were visible as they completed the form. The HTML field is useful for including custom valid HTML code on the form. This can be used for inserting text blocks, links, icons, or images to WPForms. The File Upload field enables users to include files along with their form submission. For more details, be sure to check out our guide to the File Upload field. Page Breaks separate a form into two pages or more. This can improve user experience for longer forms. 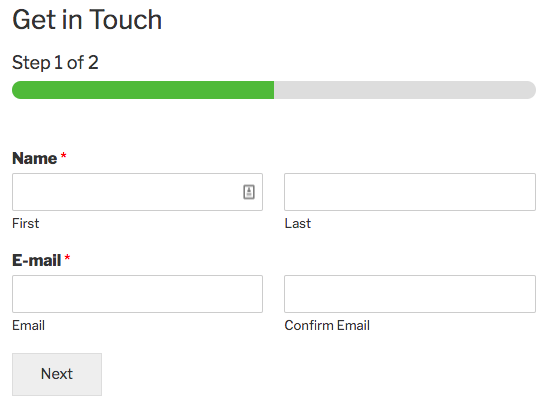 Check out our multipage form tutorial for more details on how to use and customize this field. The Section Divider displays a clear indication of a new section in the form. This is helpful for users to quickly understand what you’d like them to do next. The Rating field displays a set number of icons so that the user can visually select a number rating. Please see our Rating field tutorial for customization options. The Custom Captcha field helps combat spam form submissions from bots by requiring users to answer a question. For more details, you can check out our tutorial on using the Captcha addon. If you’d prefer, we also offer integration with Google’s reCAPTCHA to prevent spam entries. The Signature field allows users to draw in their signature. Note: The Signature addon must be installed to use the Signature field. This field is available with the Pro license level or higher. The Likert Scale field allows user to quickly choose from a range of possible options. Note: The Survey and Polls addon must be installed to use the Likert Scale field. This addon is available with the Pro license level or higher. The Net Promoter Score field lets customers easily share how they feel about your company, providing valuable insights. Note: The Survey and Polls addon must be installed to use the Net Promoter Score field. This addon is available with the Pro license level or higher. Payment fields allow users to select items with associated prices, and are available with all paid licenses for WPForms (unless otherwise noted). Note: While payment integration isn’t required to use payment fields, these are most often used with our PayPal or Stripe addons to collect online payments. Both Stripe and PayPal addons require a Pro license level or higher. The Single Item field can be used to display an individual item in a form. This can be useful for prices that are fixed and will always be applied to the total cost, such as a base fee for a program. With the Multiple Items field, users can choose a single item from any number of choices with different price settings. An image can also be added to each item choice. 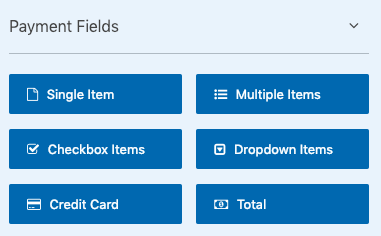 The Checkbox Items field will let users choose as many items as they’d like from any number of choices. Prices can be defined for each item individually. An image can be added to each item choice, as well. Like the items fields above, the Dropdown Items field contains a list of items with associated prices, but in a more compact format. The Credit Card field is used with our Stripe addon. It allows users to make a Stripe payment without storing any sensitive credit card data to your site. Note: The Stripe addon must be installed to use the Credit Card field. This addon is available with the Pro license level or higher. The Total field adds up the prices of selected items. That’s all! We hope this tutorial helped to familiarize you with available fields. Now that you know more about all available fields, you may want to check out how to create your first form.